ORYX 9 has built a synthetic complex universe, in a 70s Druillet psychedelic Sci-Fi similar vein, mixing up a handicraft and exhaustive sound treatment through ancient machinery, and proper mind-bending literature. “Abstraction trail”, a conceptual whole sheaf, is the result itself and the fourth 30drop ExoPlanets reference. The evocative “Subatomic Uprising in Cassiopea”’s retrofuturism meets the lisergic onirism of “Ethereal Aquadome”. Bassdrum goes harder on the delayed hipnotism of “Magma-45 Decaying Path”, a planetary decadence tale. And finally, “Ultraviolet (Light of Tsih)”, a cosmic endless melody from a dead constellation, winds up the EP. Ángel Molina Superb SciFi / Mills-esque stuff, all my support to this release, thanks!! Arnaud Le Texier Subatomic Uprising In Cassiopea for me. Thanks. Ben Klock Nice deep bleeps here. Blawan A1 is really nice! Cio D'Or Wow! Thanks for that great Bleep-Techno! It is perfect for my set! Dave Miller/Abstract Division Nice spaced out tracks! Dimi Angelis Dope EP, space. Like A1 and A2 most. Electric Indigo Love it, really sweet. Will certainly play A1, A2 and B2. Many thanks! Exium Great stuff, love it, thanks. Fran Hartnett Beautiful. Absolutely beautiful music here. I've just been sifting through my promo inbox here and this stands head and shoulders above most! Support and much love from Dublin! Geistform / Univac Great sine tone floating over the tech-base. Retrofuturist and cosmic style. My fav: A1. Subatomic. and the great B2. Ultraviolet. Thanks! Go Hiyama I need this sound. Thanks. HD Substance Cosmic and futuristic as I like. Josh Wink Hypnotic SciFi Techno. Nice! Kamikaze Space Programme Trippy bleepy wonderfulness! Leandro Gámez B1.Magma-45 Decaying Path & B2.Ultraviolet (Light Of Tsih) are my favorites. Thanks!! Markus Suckut Great EP full support. Orde / Slam Love it – underwater music – thanks. Oscar Mulero Support. Will play A1. Subatomic Uprising In Cassiopea. Thanks! Philip Sherburne Cool stuff. I always like bleepy techno like this, and the closing ambient track is a nice bonus. Rødhåd A1 is my fav here. Thanks. 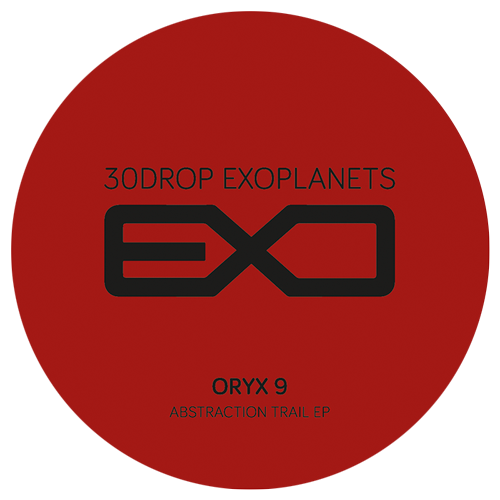 Robert Lamart Full support for this cosmic release of Oryx 9 in 30drop!! Big! Thank you. Samuli Kemppi Subatomic Uprising in Cassiopea is my pick. Really good. Thanks! Takaaki Itoh Ethereal Aquadome and Magma-45 Decaying Path are for me. Solid EP! Tensal A2 fav here, thx! !